This piece is a continuation of my Vegetation on Oilcloth Series. 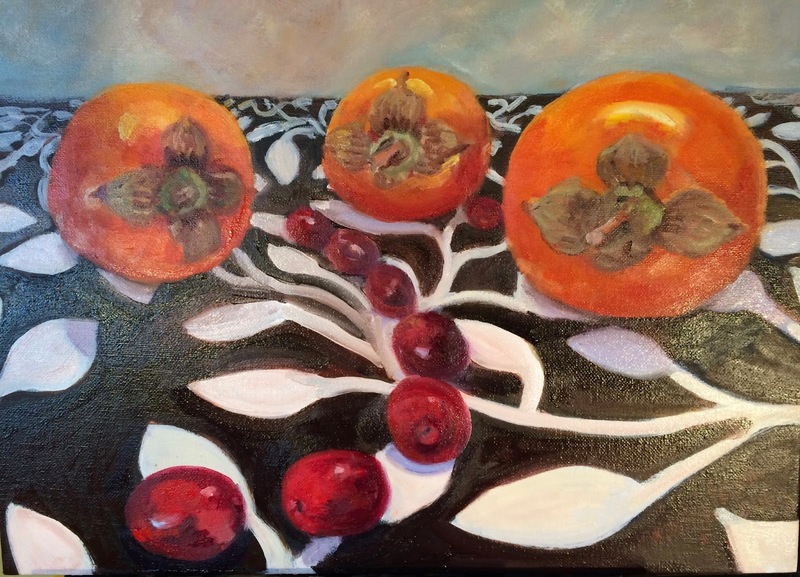 I chose cranberries and persimmons to have together in this work because I like the way their shapes mimic each other, and the way the warm-colored fruit looks on the black and white oilcloth. I played a lot with the composition to get it "just so." I started doing this painting by using the underpainting technique I learned in Dreama Toll Perry's course this fall. But I didn't complete it using her using Dreama's ala prima painting style because getting the colors to work well together well involved a lot of experimentation. I like the result in the end, and I hope you will too. I'm considering putting this series up in my gallery on the Fine Art America site because I believe they'd make great subjects for people who wanted to make cards or to get prints of the series for their kitchens, etc.. What do you think? Should I do that? Vegetation Portraits on Oil Cloth?